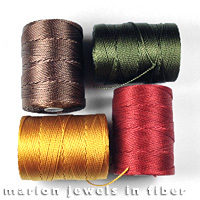 C-Lon Bead Cord is a 3-ply twisted multi-filament bonded nylon cord available in 116 colors. The color range is fabulous, with lots of bright jewel colors and subtle tones. It is perfect for simple or complex beading projects, micro-macrame jewelry, bead crochet, cordmaking, kumuhimo braiding, half-hitching, Cavandoli tapestry knotting or tatting. C-Lon Bead Cord is comparable to Tuff Bead Cord Size 5, D&E Nylon #18, Beadsmith Nylon #18, Conso Nylon #18 (discontinued), or Mastex Nylon #18 (discontinued), with the added attraction of the widest color range on the market and a smaller price per spool. This cord is the standard size for micro macrame jewelry. Other cords and thread in the C-Lon family are the C-Lon Micro Cord Tex 70, the new C-Lon Fine Weight Bead Cord Tex 135, the heavyweight C-Lon Tex 400 Bead Cord, plus the finer beading thread, C-Lon Beading Thread Size D & Size AA. Personal Note - I use this thread alone or combined with Conso, D&E, Tuff Bead Cord, Mastex Nylon #18 and silk such as Kanagawa, Fujix and Madeira. The color range is beyond my wildest dream. The color chart just got reshuffled. About colors - While every attempt was made to reproduce thread colors accurately, colors on your monitor may not precisely match actual thread colors. Dye lots from manufacturer may vary.